Every election department (and many advocacy groups) create flyers and small booklets to help voters learn about elections. But when we looked for guidelines for good communication with voters, we found very little. There were some political science and social psychology experiments that measured the impact of get-out-the-vote campaigns, but there was little about what questions voters have, and how to answer those questions well. As a companion to the research on county election websites, we did a study of how new voters used election information booklets. We recruited people who had voted for the first time in the 2008 election or later. Our participants were young people, recently naturalized citizens, and people with lower literacy. As new voters, we hoped that they would remember their first experiences clearly and would still have questions about elections. We worked with a selection of voter education materials that we thought were pretty good: clearly written, attractively designed, with good information. We asked our participants to choose two of them to read, marking any sections they thought were particularly good or particularly confusing. And then we talked about what they read. Many other questions were about the basic mechanics of voting, from eligibility and ID requirements, to finding their polling place, to the details of how to mark their ballot. When we sorted out all the data, we weren’t surprised to find that the overriding concern was being able to act on the information. That fits the definition of plain language: information voters can find, understand, and use. These less experienced voters wanted specific instructions that would let them vote with confidence. For example, they weren’t sure how long your voter registration “lasts” or even that they might have options for voting, not only on Election Day, but in early voting or by mail. They liked the confirmation and reassurance of seeing information they already knew. Start with a roadmap. A table of contents or a simple list of the main topics helps voters understand what the booklet covers. For example, the Leon County Voters Guide opens with the announcement that there are “3 ways to vote.” Participants used this to make sure they read about all the options. 1 page : 1 topic. 1 topic : 1 heading. Clear headings, starting new topics on a new page, and a good structure for the topics mean that someone flipping quickly through the booklet doesn’t miss anything. Use visuals to reinforce meaning. Icons, instructional illustrations, maps, and images of ballots were all helpful. They are particularly important for people who don’t read well. Be specific about dates and deadlines. Formulas like “You must register at least 21 days before the election” forced them to solve a problem instead of just telling them. Chronological lists and calendar layouts both worked well. Include information about how to vote. Help voters know what to expect, no matter where they vote. Be sure to cover all the steps from signing in and the poll book to marking and casting the ballot. That’s a good goal for any voter guides or election information. Thanks to Whitney for sharing these insights, which can (and should!) be a guide for any office seeking to help voter’s with their hero’s journey at the polls. Previous: It’s National Voter Registration Day! 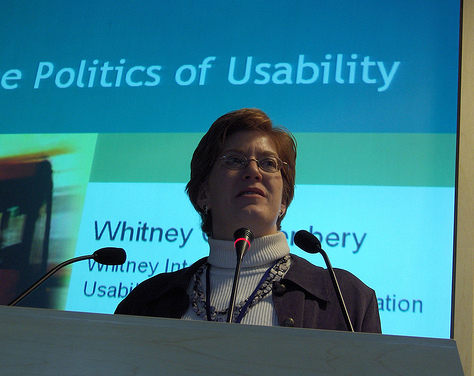 Be the first to comment on "Whitney Quesenbery on Making Voting Information Work for Voters"